There's been an escalation of conflict in Libya. Fighting has moved to the outskirts of the capital, Tripoli, and the United Nations has called for a ceasefire. Moina Spooner from The Conversation Africa spoke to Jacob Mundy, author of a recent book on Libya's ongoing civil conflict, about what's happening and what can be done to end the clashes. This appears to be the most serious escalation in the fighting since the current Libyan civil war started in 2014. This war emerged when the end of Muammar Gaddafi's longstanding regime created a vacuum that various factions tried to fill. Today Libya is divided between two political-military authorities: a parliament in the east backed by Khalifa Haftar's Libyan National Army, which now controls large swathes of territory, and an internationally recognised executive in Tripoli backed by militias largely based in the capital and the region around it. Initially, the fighting was mainly on the outskirts of Tripoli but it now appears that there's fighting in other locations further east and in the south, near the Sahara. But these are scattered incidents. A serious concern is the possibility of a long, drawn-out siege of the capital. In recent years this happened in Libya's largest second city, Benghazi, as well as the smaller towns of Derna and Sirte. All three suffered enormous infrastructural damage and witnessed significant violations of the civilian populations' rights at the hands of the militias and terrorists fighting for control. The wider metropolitan area of the capital is home to nearly a third of all Libyans, so the threat to noncombatants --- like the recent surprise aerial assault on the civilian airport --- is very real. In 2014 Haftar created an alliance of militias to restore security in Benghazi. After the 2011 revolution, Libya witnessed a proliferation of militias, including violent Islamist ones with ties to Al-Qaida and the Islamic State. Haftar and his supporters accused Libya's interim leaders of turning a blind eye to this growing menace. Haftar's forces are called the Libyan National Army. But, like all such security forces in Libya today, this army is really a coalition of militias. The increasingly professional look of Haftar's troops and equipment is a result of the support he gets from Egypt and the United Arab Emirates. He appears to enjoy Saudi and Russian support, too. Even France has coordinated with Haftar on counter-terrorism matters. In terms of domestic politics, Haftar is backed by Libya's House of Representatives, the country's interim legislature, which has been based in the east of the country since the civil war broke out in 2014. Haftar's assault is officially targeting militias that he describes as "terrorists" in the capital. But in reality his opponents are the various militias that have controlled Tripoli for a number of years, including forces from the powerful city of Misrata. Many of these militias are allied to Libya's internationally-recognised executive authority, headed by Fayez Serraj. 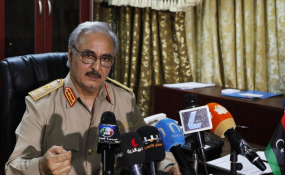 It's unclear what exactly triggered Haftar's sudden move to "liberate" Tripoli. His recent military successes in the east and the south have been the result of months of logistical and social preparation --- that is, building alliances with potential allies in the places he seeks to conquer. Donald Trump's administration in the US appears to be taking the matter more seriously after deeming Libya not worth its attention for two years. But there are indications that Italy and France are working at cross-purposes in Libya, and Russia may be too. Those with acute leverage over Haftar in Egypt and the Gulf are perhaps the least likely to use it. The situation will also be very difficult to deescalate because Haftar's apparent all-or-nothing blitz has painted him into a corner. Those who voiced concern that he wanted to impose himself as a dictator now have all the proof they need. Whatever various grievances had been driving the conflict in Libya in recent years, it now boils down to one issue --- the Haftar question. This clarity of purpose could be the galvanising force Haftar's opponents have often lacked.